15-inch reference? 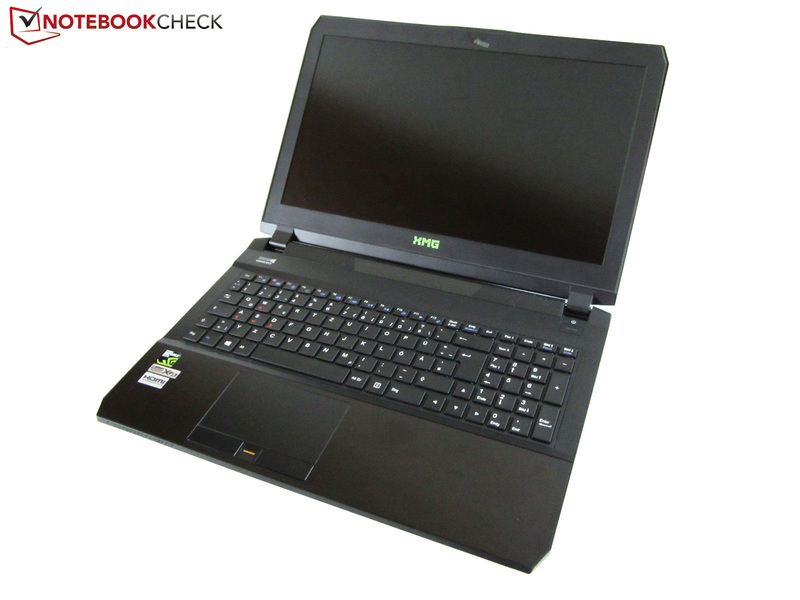 The XMG P505 from Schenker Technologies is supposed to close the gap between big 17-inch systems (Asus G751, MSI GT72) and ultra-thin compact gamers like the Gigabyte P34G v2. We have already reviewed the configuration with the GTX 970M, now we have a closer look at the GTX 980M. Because of the enormous demand we have decided to review the Schenker XMG P505 Pro for a second time. 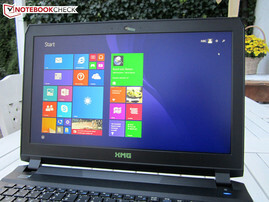 Unlike the first article, the 15-inch notebook is not equipped with a Core i7-4870HQ, but a Core i7-4710HQ, which has a positive effect on the emissions. Other changes are the IPS display (Full HD instead of QFHD) and the storage solution (SATA-III SSD instead of a PCIe-x4 SSD). But the main reason for the new review is the graphics card: The configuration with the GeForce GTX 980M uses a slightly thicker chassis. 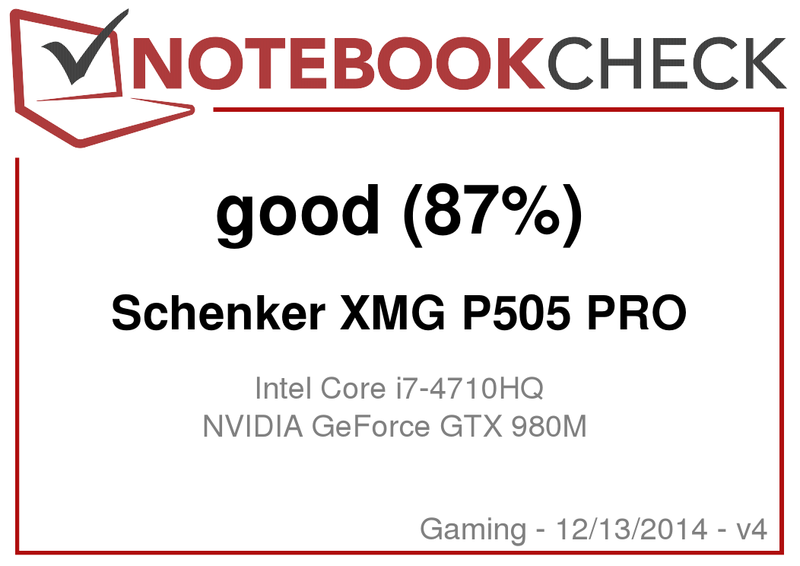 Even though Schenker uses the same XMG P505 designation, you get – depending on the GPU – a different chassis. While the GTX 970M sits in the 2.5 cm (~1 inch) slim P651SE Barebone, the P651SG has a height of almost three centimeters (~1.2 inches). The case manufacturer Clevo reinforced the slim metal bottom with a plastic coating to improve the cooling of the hardware. The cover and the palm rest are still made of aluminum, so the quality impression is good nonetheless. The same applies for the build quality and the stability. Otherwise, you have to search for the changes with a magnifying glass. You will hardly notice a weight difference of around 100 grams (~3.5 ounces) in practice, the same as the different shape of the fan exhaust at the back. 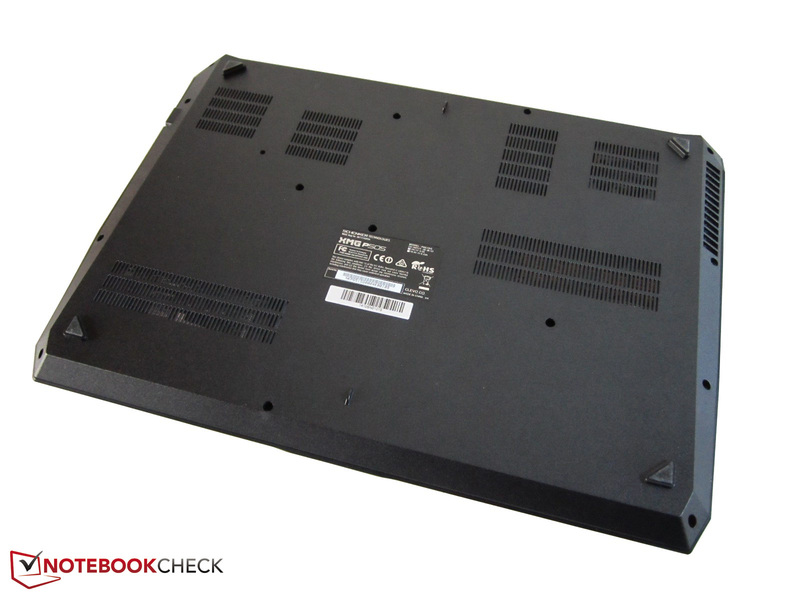 The ports of the P651SG Barebone are identical to the P651SE. Three digital video ports are just as generous as three audio ports. Four USB 3.0 ports are pretty much standard right now. As you can see in the pictures, the majority of ports is located at the right side of the case. While the wireless module of our first review unit did not work, we can check the signal quality of the WLAN chip this time. The Intel Dual Band Wireless-AC 7265 M.2 module for an additional price does not leave anything to be desired: Bluetooth 4.0, up to 867 Mbps, 2.4 and 5.0 GHz as well as support for the latest ac standard. Even distances of 10-15 meters (~33 – 49 ft) from the router and through several walls are no problem for the XMG P505. 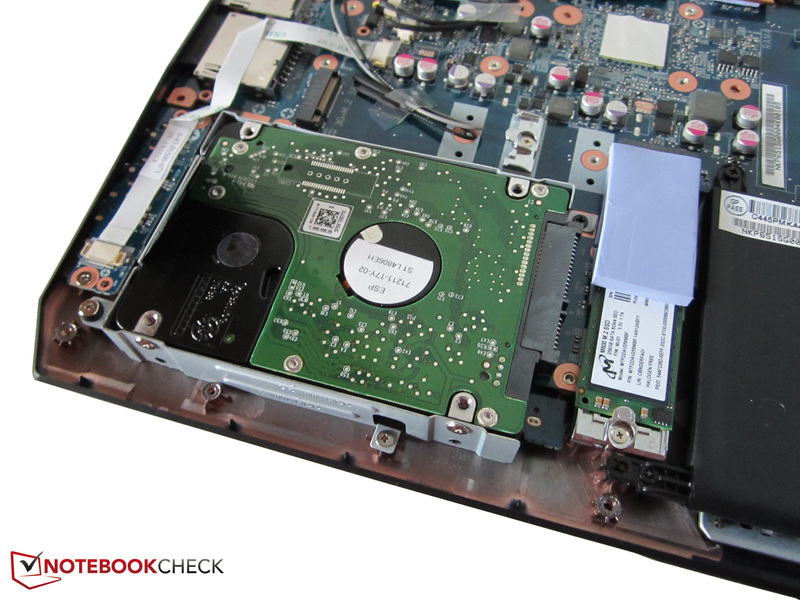 The internal layout just slightly differs from the P651SE Barebone. You once again have to loosen several screws before you can remove the bottom cover (the easiest spot to lift the bottom cover is around the RJ45 port). After that you can access almost every component, including the fans, the hard drives (2x M.2 & 2x 2.5-inch), the battery or the secondary memory slots. Except for the processor and the graphics card, you can remove every component. The primary memory slots are hidden underneath the keyboard, which is only secured with two screws (thanks to a tiny hole at the bottom it is easy to push the keyboard out). There is no news in terms of security features. 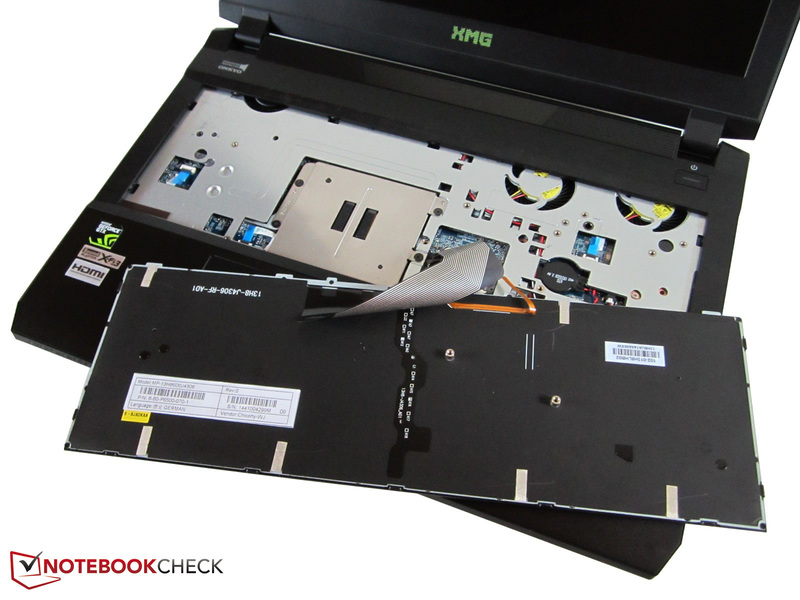 A fingerprint reader and a TPM 2.0 chip are not a matter of course for a gaming notebook. 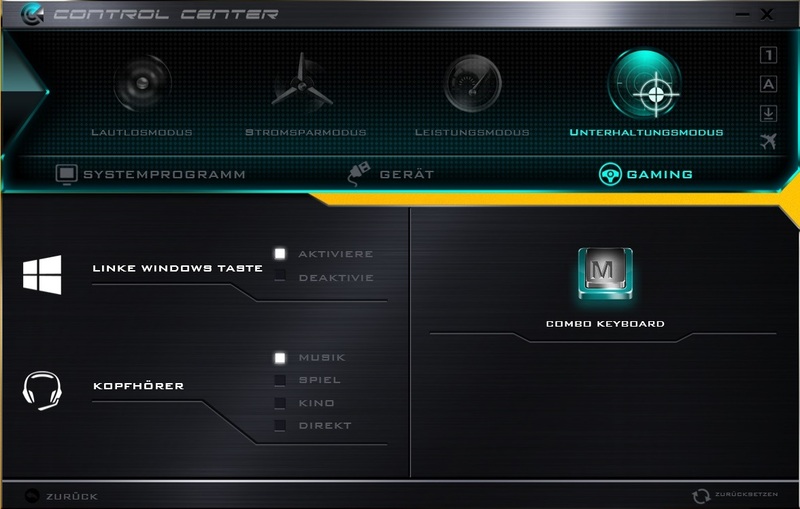 The software is almost identical as well, but the Gaming tab in the Command center has been complemented by a feature called Combo Keyboard, which can be used to create and manage macros. Supplied accessories include a cleaning cloth, a manual, a driver DVD, an XMG sticker as well as screws for a hard drive. Furthermore, there is a 180-Watt power adaptor weighting 844 grams (~1.86 lb). It is not really small with a size of 16.9 x 8.5 x 3.6 centimeters (~6.65 x 3.35 x 1.42 inches). The warranty depends on the wallet of the potential buyer. You can choose between 24, 36 or 48 months. The quality of the input devices is decent in our opinion. There is some room for improvements (typing noise, feedback of the touchpad button, ...), but all in all both the keyboard as well as the mouse replacement do a pretty good job. 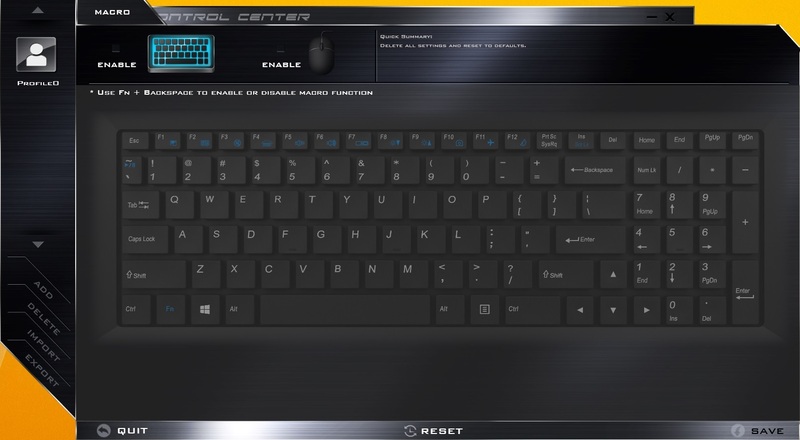 There is hardly any criticism for the layout and typing experience of the chiclet keyboard, which has a white background illumination. The touchpad itself has a generous size and a smooth surface. More details are available in our first review. One of the biggest highlights is the display. The "standard" HD panel is not quite as bright as the 4K option (~274 vs. 333 cd/m²), but the AU Optronics B156HAN01.2 still produces an excellent picture thanks to the IPS technology. 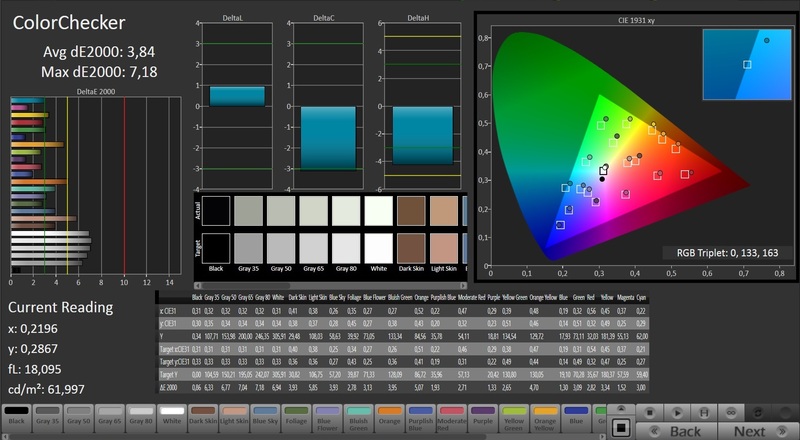 It does not matter if you look at the color accuracy, RGB balance or saturation level: Conventional TN panels usually have a hard time to compete with IPS screens. 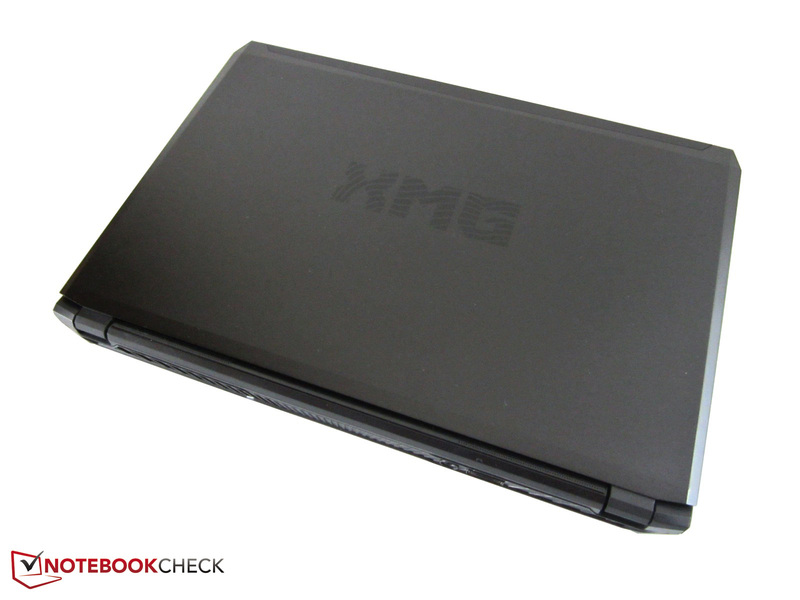 The XMG P505, for instance, does not suffer from the blue cast, which is typical for notebook displays. The viewing angles are respectable as well, both with horizontal as well as vertical shifts. Even wider angles only result in small picture distortions. We liked the low black value in particular. Compared to other panels, dark gaming and video scenes, respectively, appear very sharp and not washed-out. 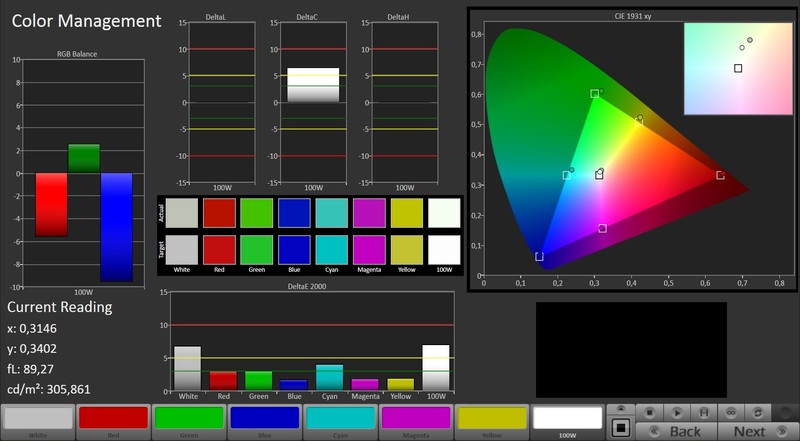 In combination with the high contrast (~1,200:1) you can see all contents perfectly. 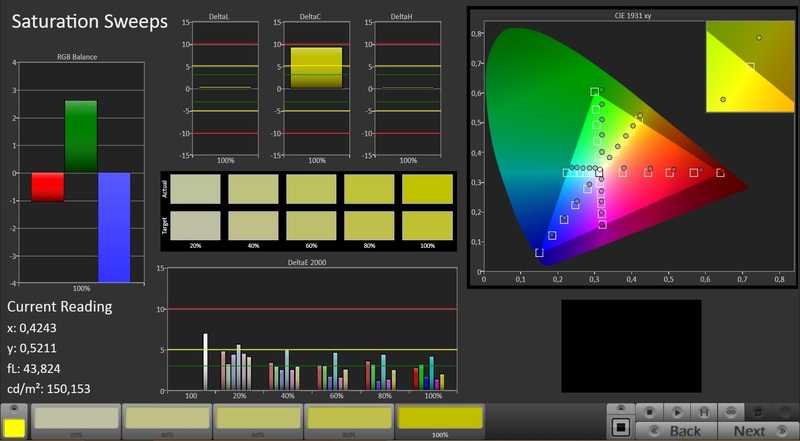 The only criticism concerns the brightness distribution. 85% are just average, especially since our review unit had issues with screen bleeding in the lower left corner. Because the 4K panel consumes much more power (see Energy Management) and often had scaling issues (size of windows, etc.) we would recommend the Full HD screen. Another positive aspect of the AU Optronics B156HAN01.2 is its matte surface, which means it is more comfortable to use outdoors. 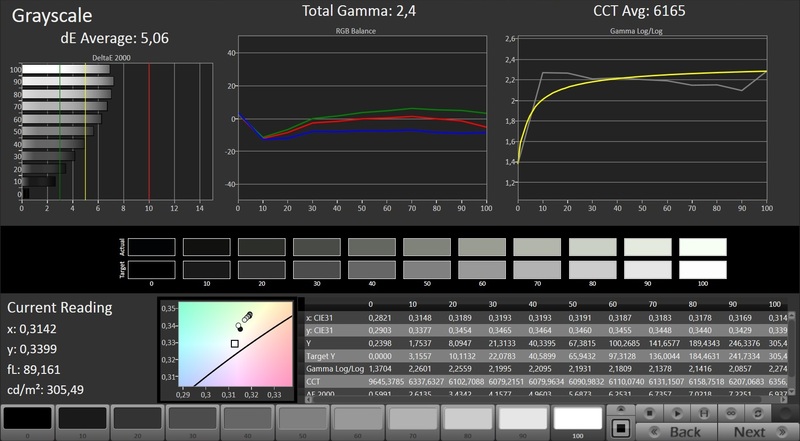 Note: According to the Schenker homepage, the panel is supposed to cover 100% of the sRGB color space, but our measurements only determine 91% (Correction 20.5.2015 due to a wrong sRGB-reference-profile). 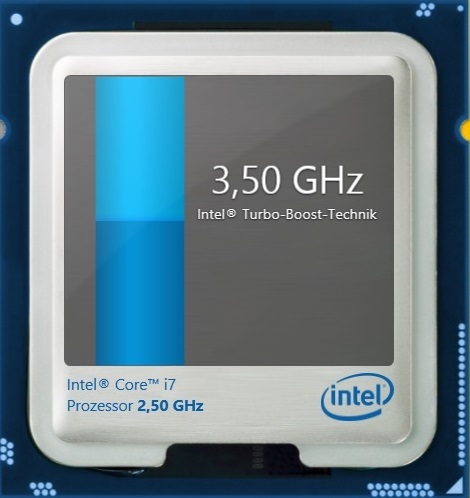 Intel's Core i7-4870HQ, which powered our last review unit, is not available anymore in the configurator. This is a good thing, since the low performance advantage cannot compensate the temperature and therefore noise development. With 2.5-3.5 GHz, the Core i7-4710HQ is just marginally slower than the Core i7-4870HQ (2.5-3.7 GHz), although the more expensive sibling offers the more powerful integrated GPU (Iris Pro 5200 vs. HD Graphics 4600). 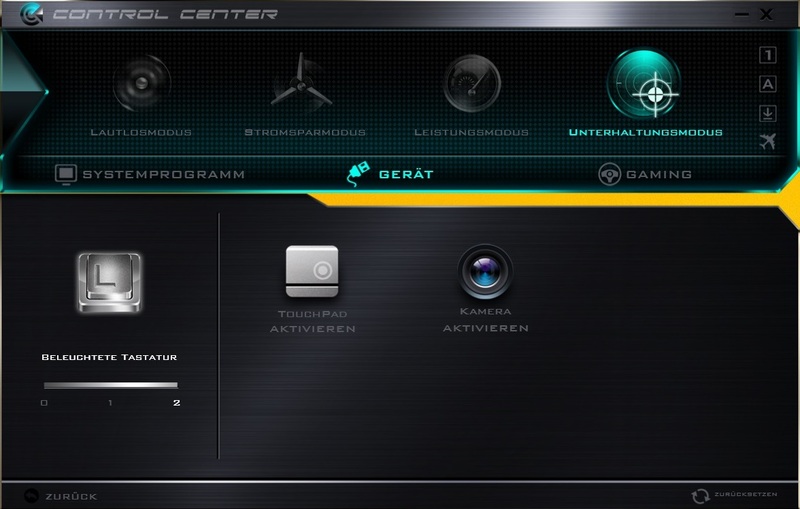 However, this aspect is not really important considering the dedicated GPU. 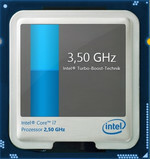 The other specifications are similar: Both Intel quad-core CPUs have 6 MB L3 cache and a TDP of 47 Watts. The Turbo Boost feature leaves mixed impressions. While CPU benchmarks result in 3.2-3.5 GHz, the clock occasionally drops to 2.5 GHz in 3D applications, which is the nominal value. However, the drops are pretty short, so you hardly recognize the fluctuating Turbo Boost. 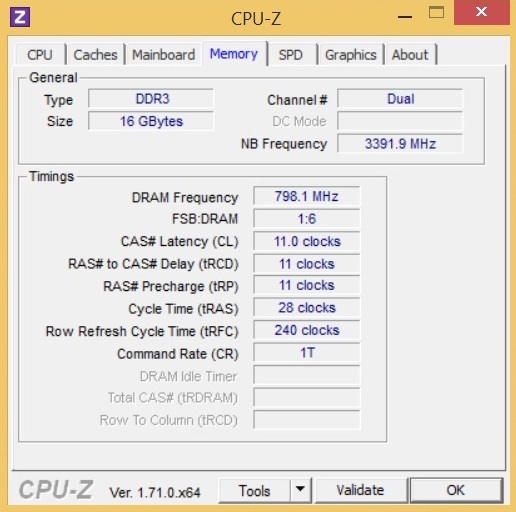 The feared throttling is only an issue under impractical maximum load, where the clock fluctuates between 1.0 and 2.3 GHz. 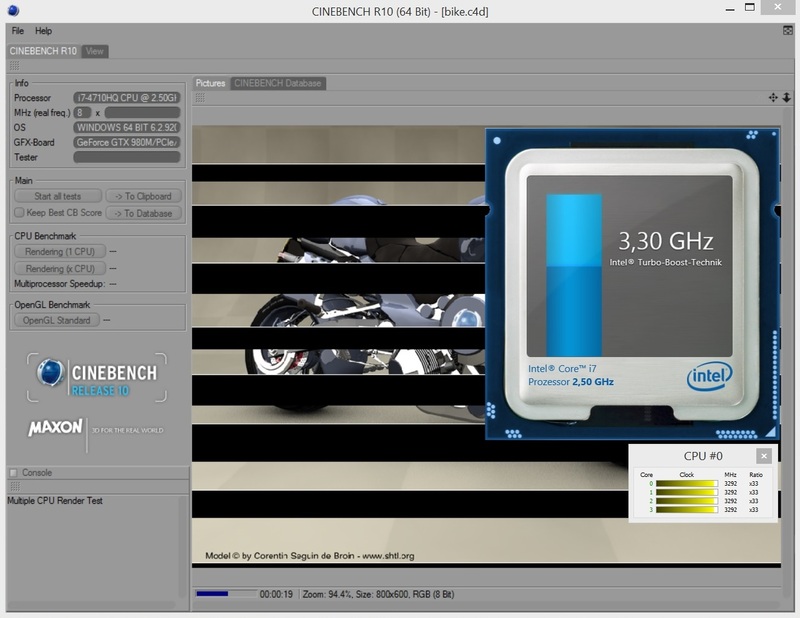 The Cinebench R15 results are similar to other notebooks with the Core i7-4710HQ. 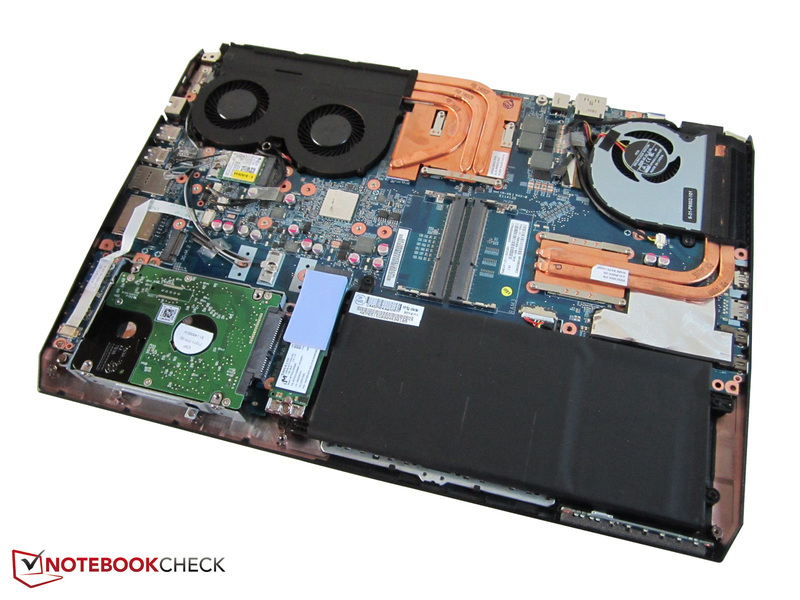 135 points in the Single-CPU test are managed by the MSI GT72 2QE, for example, as well. 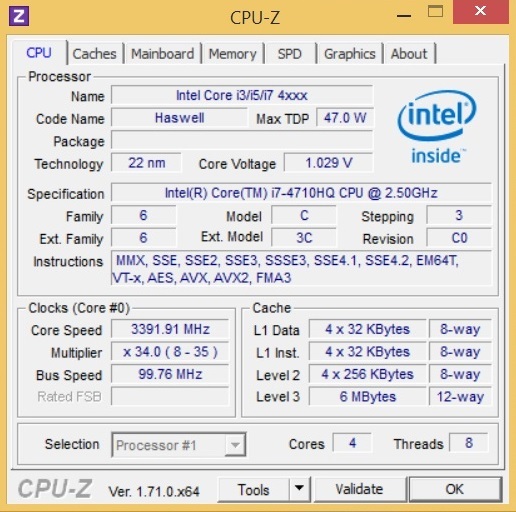 The Core i7-4870HQ is 5% faster (142 points). 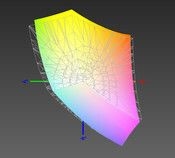 The Multi-core test shows a similar picture. 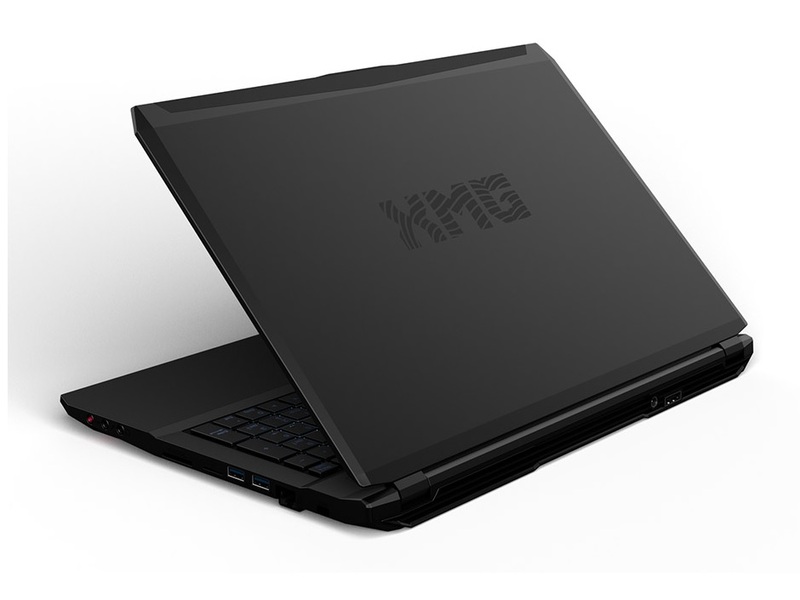 With 660 points, the XMG P505 is on par with the competition (661 points @ Asus G751JY). 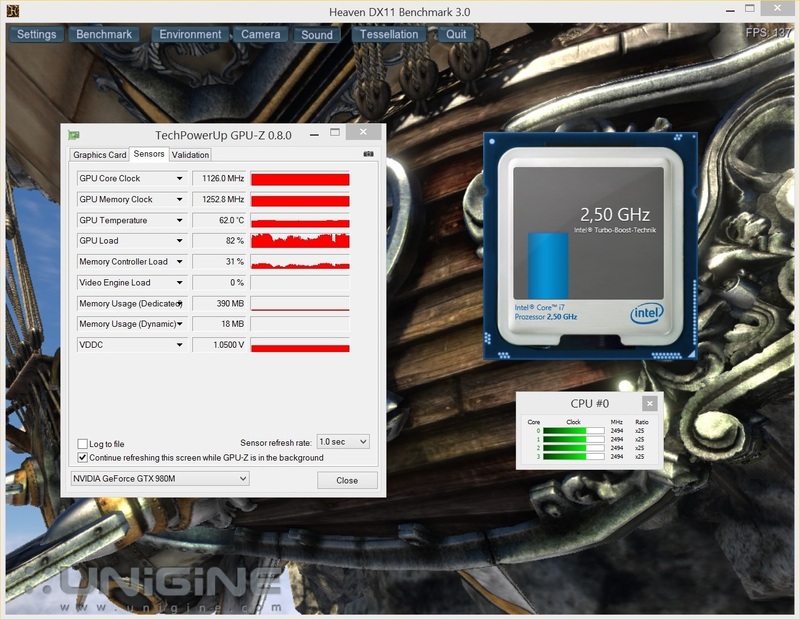 That a weak Turbo Boost affects the result is confirmed by the Gigabyte P35X v3. Despite the identical CPU it only reached 629 points, the Core i7-4870HQ on the other hand is almost 7% ahead (709 points). Nvidia created a great high-end GPU with the GeForce GTX 980M. The important new feature is the Maxwell architecture, even though the number of shaders has not been increased (1536 CUDA cores), the GTX 980M has a much higher performance compared to its predecessor. One reason for this is the increased clock. 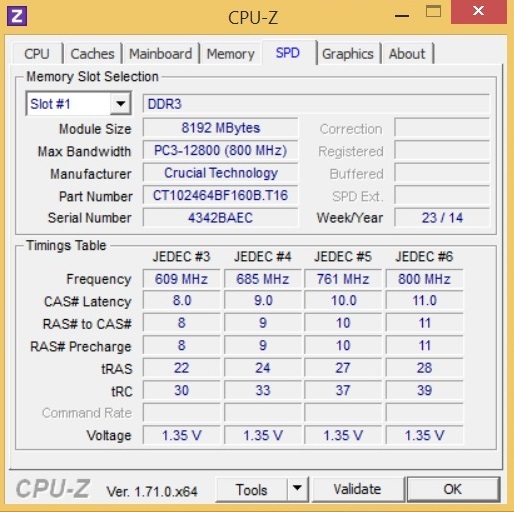 Instead of 1,083-1,127 MHz, the old GTX 880M only ran with 954-993 MHz. 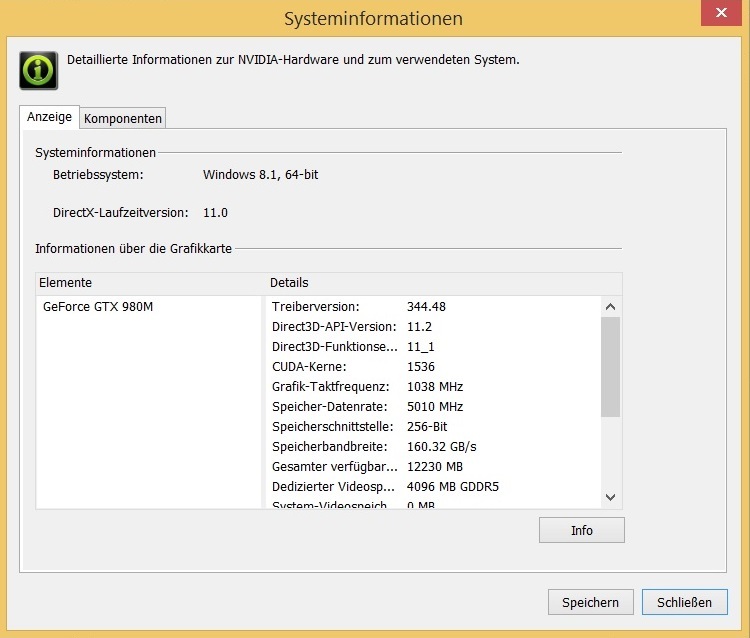 The GPU uses 4 GB GDDR5 video memory, even though there is also one version of the GTX 980M with 8 GB (Schenker W504/P504). Some games like Shadow of Mordor benefit from every additional GB. 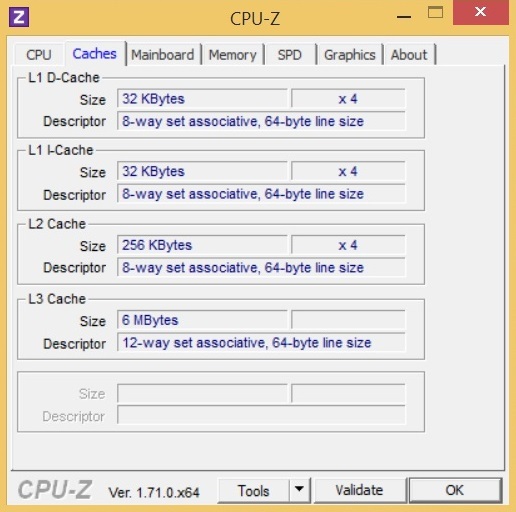 Independent of the memory size, is the 256-bit memory interface. For comparison: The GeForce GTX 970M uses a 192-bit memory interface (3-6 GB GDDR5), 1,280 CUDA cores and a core clock of 924-1,038 MHz. Besides the CPU tests, the GPU benchmark results are on the expected level. The XMG P505 manages 116.4 fps in Unigine Heaven 3.0 (1920x1080, normal tessellation) is between the MSI GT72 2QE (119 fps) and the Gigabyte P35X v3 (110.3 fps), which are also powered by a GTX 980M. 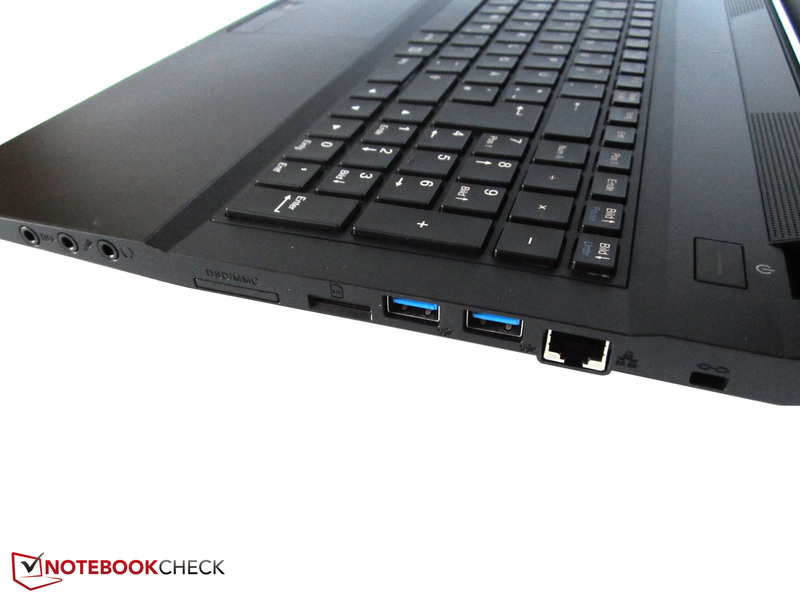 The GTX 970M of the P651SE Barebone is around 20% slower than its larger sibling (93 fps). 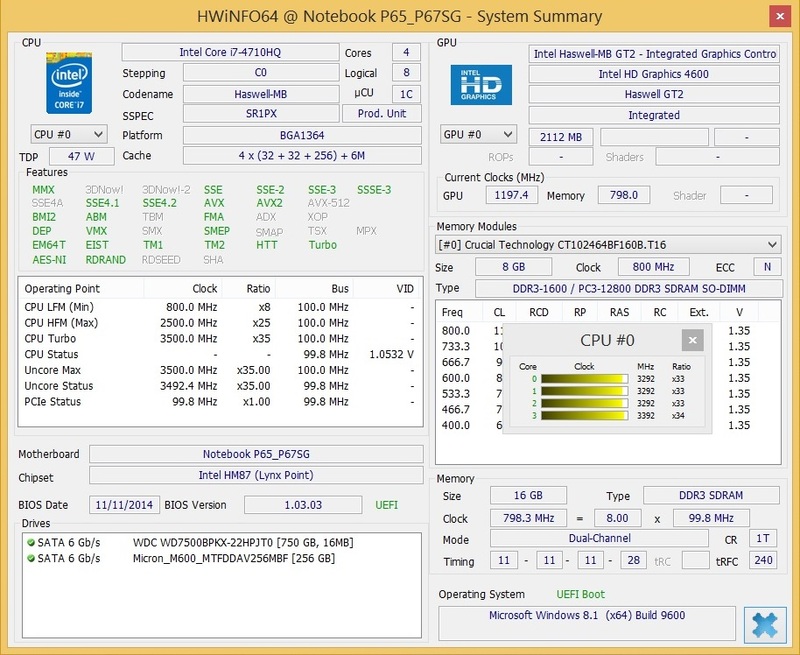 The GTX 980M notebooks are also neck and neck in the 3DMark 13 Fire Strike test. 9,807 points (GPU score @ P651SG) are just as great as the 9,819 points of the Asus G751JY and 9,808 points of the MSI GT72 2QE. The Gigabyte P35X v3 follows in the fourth place with 9,741 points. Owners of a GTX 970M will have to live with around 7,300 points (-26%). We recommend a Solid State Drive with a PCIe interface if you are looking for the maximum performance. 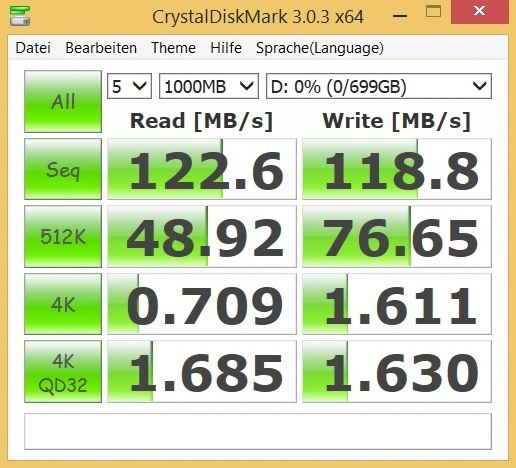 The 256 GB version of the Samsung XP941 managed more than 1,000 MB/s in the sequential read test, and 713 MB/s sequential write do not indicate a standard SSD, either. 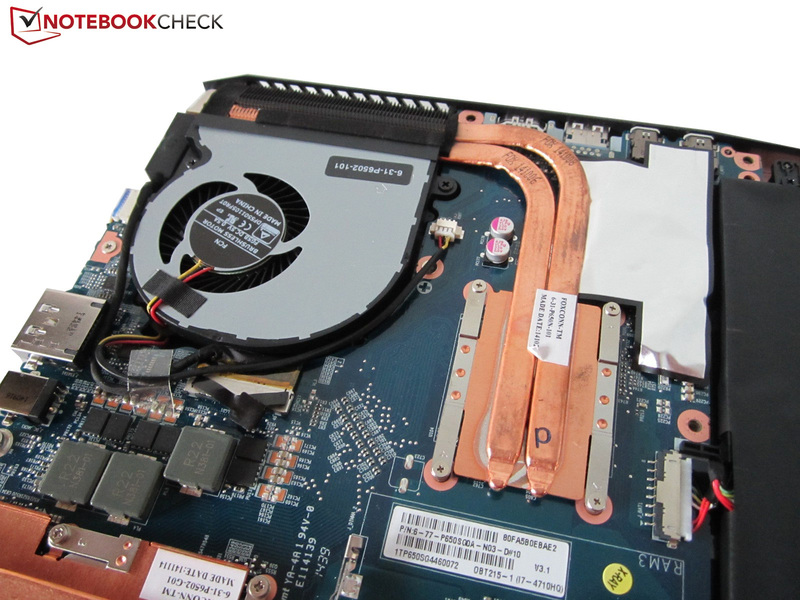 Our second review unit uses a SATA-III version. 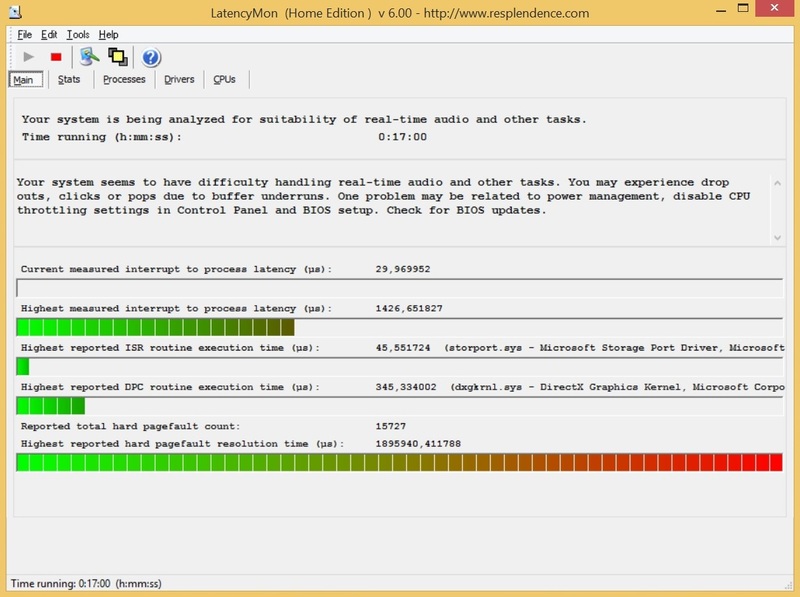 The Micron M600 is also an M.2 drive, but is only roughly half as fast in the sequential tests. The situation is better with 4K files, where the type of SSD does not seem to be that important. 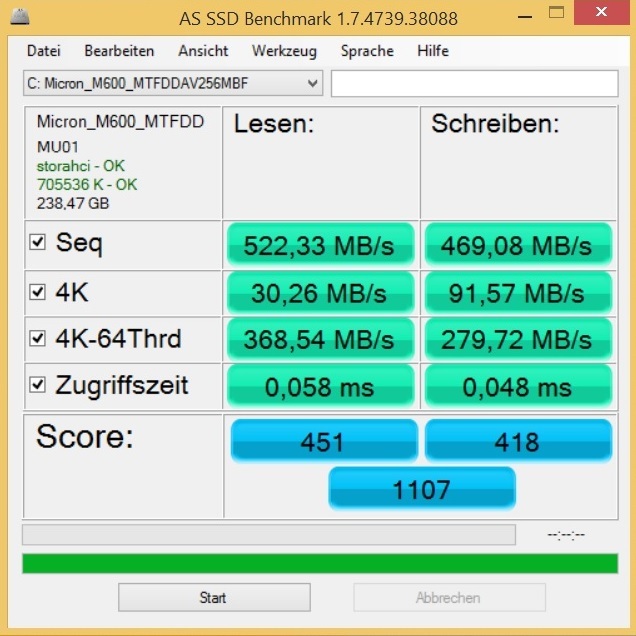 AS SSD determined access times between 0.048 and 0.058 ms (0.052-0.099 ms @ Samsung XP941). 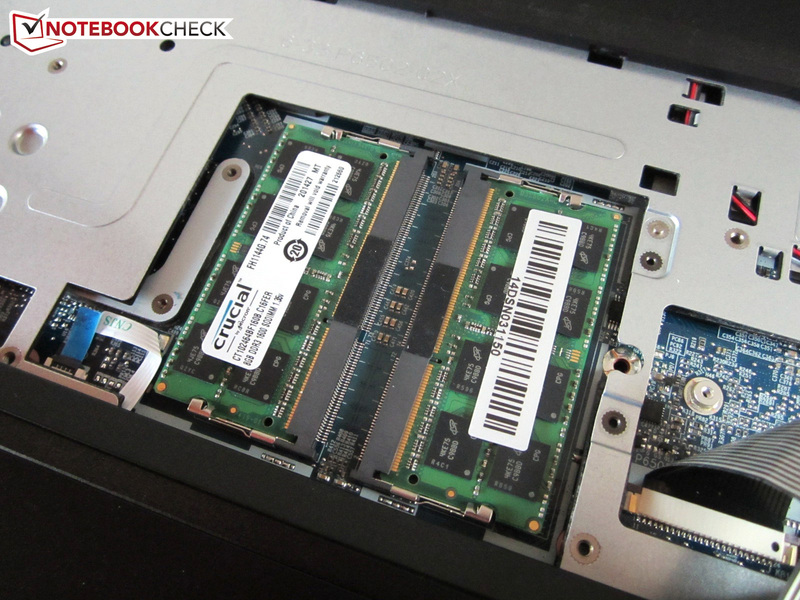 The Micron M600 is complemented by a 750 GB HDD. 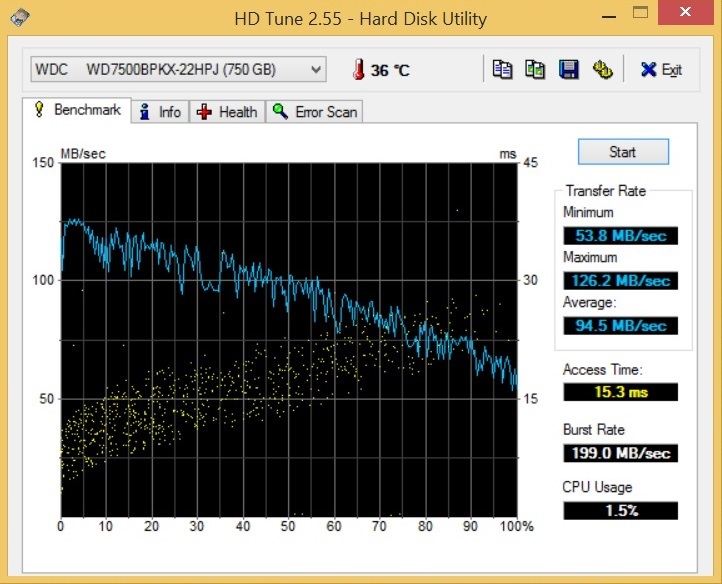 The Western Digital Black is very fast for a conventional hard drive, but also pretty loud at the same time. However, this is not a surprise for a drive with 7,200 rpm. 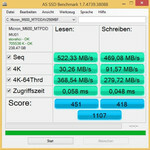 There are no complaints about the system performance when you use an SSD. 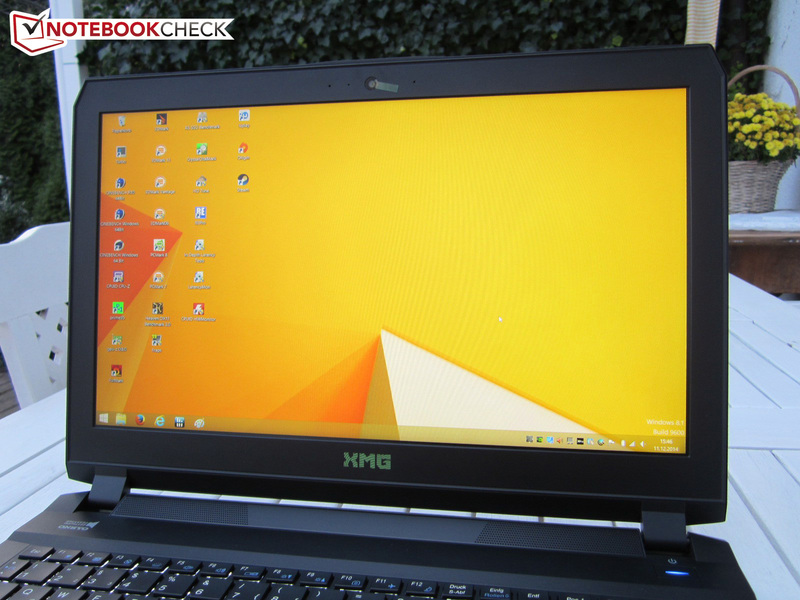 The XMG P505 manages more than 6,000 points in PCMark 7, both with the Micron M600 as well as the Samsung XP941. 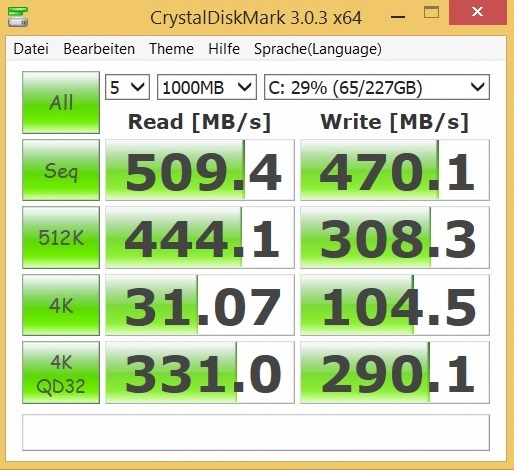 The similarly equipped Gigabyte P35X v3 also reaches more than 6,000 points thanks to the SSD-RAID. 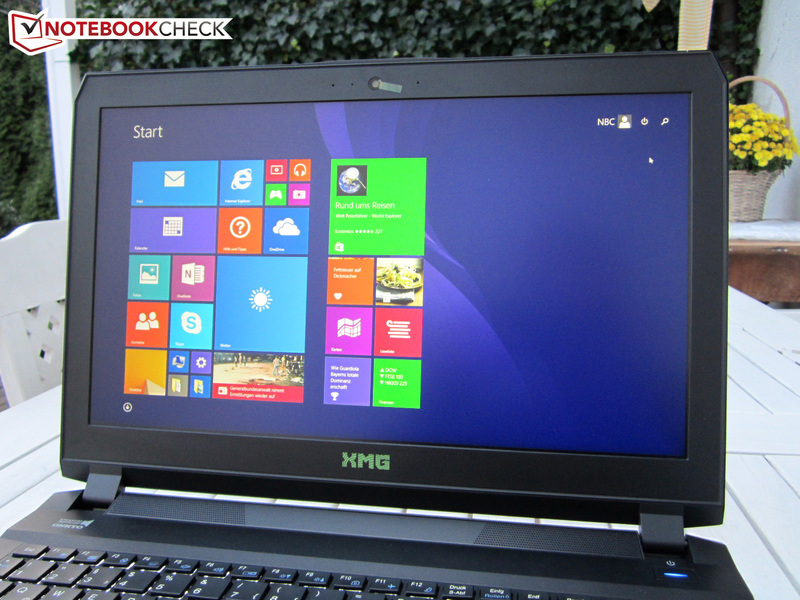 The XMG P505 is a good replacement for gaming enthusiasts who do not want a desktop PC. The GTX 980M is the only notebook chip that manages all modern titles in the native Full HD resolution and with the highest details. Currently Assassin's Creed Unity is one of the most demanding games. 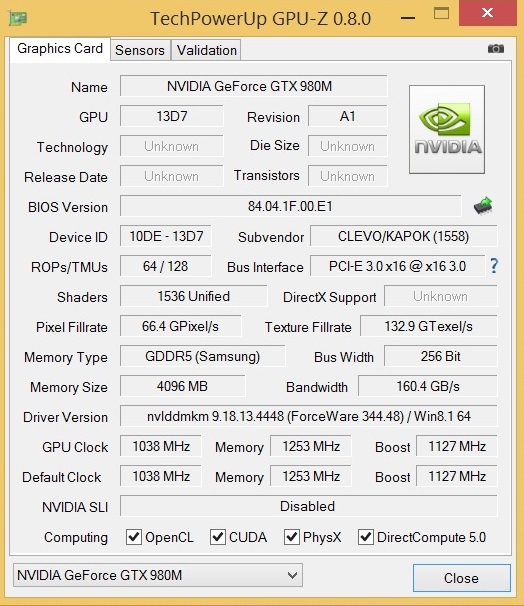 More than 30 fps are impossible even for the old high-end model GeForce GTX 880M – at least in the Ultra preset. Other action games like Far Cry 4 and Call of Duty: Advanced Warfare even run with more than 50 fps in the highest preset. We were not that happy with the preinstalled GPU driver (ForceWare 344.48). In addition The Crew and F1 2014, Saints Row IV refused to start as well. There were also some problems with the fullscreen mode (Dragon Age Inquisitionhttp://www.notebookcheck.net/Dragon-Age-Inquisition-Benchmarked.131101.0.html) or the centering (The Evil Within @ 1920x1080). Assassin's Creed Unity also only worked in the Ultra preset; the game repeatedly crashed with lower settings. 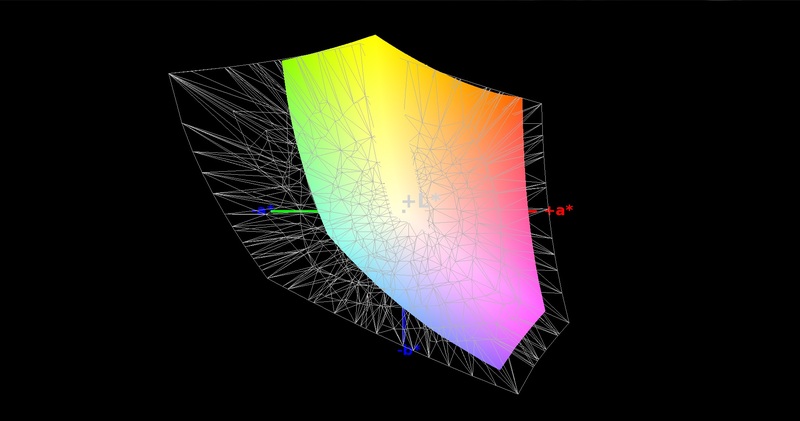 One of the biggest surprises is the noise development. Even though the P651SG Barebone has a more powerful graphics card, it is quieter than the GTX 970M version under 3D load. One reason should be the thicker chassis, but also the CPU (4710HQ vs. 4870HQ). 40-45 dB(A) in 3DMark 06 is really not that much for a high-end notebook. We determined 44-47 dB(A) for the P651SE under the same conditions, which is definitely audible in practice. 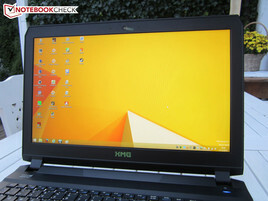 Slimmer 15-inch gaming notebooks like the Gigabyte P35X v3 (21 millimeters; ~0.82 inches, high) are much louder than that; the rival with the GTX 980M reached 51-55 dB(A) in 3DMark 06. The Gigabyte P35X v3 only wins while idling, the Clevo Barebones cannot compete with 29-36 dB(A), but 30-38 and 30-37 dB(A), respectively, are perfectly acceptable as well. 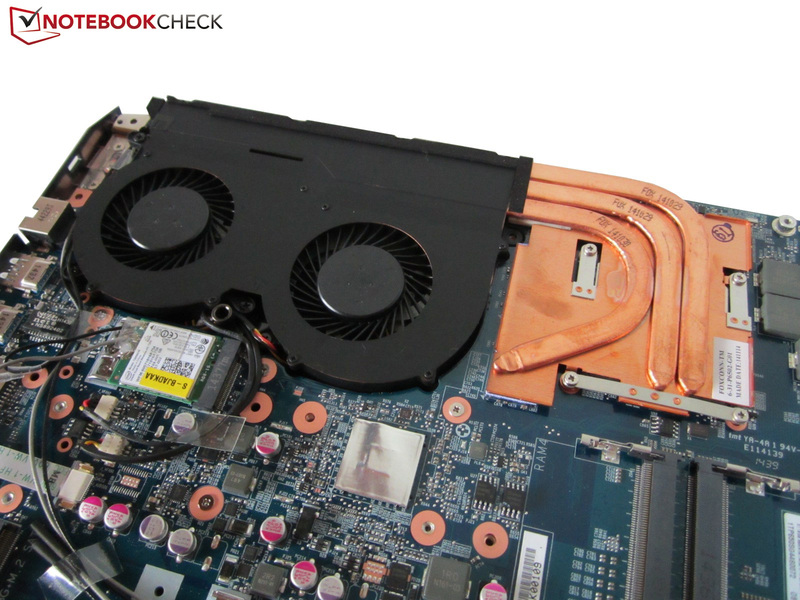 The fan behavior is okay, the cooling is restrained with light workloads (no frequent pulsating). You should only use SSDs if you want it as quiet as possible since the hard drive is the primary source for noise while idling. Thanks to the less powerful processor, the chassis stayed much cooler than in our last review. After one hour maximum load with the tools FurMark and Prime95, the P651SE Barebone reached up to 76 °C (~169 °F) – a pretty high result. The P651SG gets quite hot as well, but up to 59 °C (~138 °F) in the area of the fan exhaust is not a major issue, especially since the temperatures should be lower during gaming, and the palm rest is always comfortable to touch (less than 30 °C ;~96 °F). Despite the slimmer construction, the Gigabyte P35X v3 can keep up in 3D applications. The idle test favors the XMG P505; the Schenker notebook was around 8 °C (~16 °F) cooler after an idle period of two hours. Another interesting aspect is the internal temperatures. Instead of a CPU temperature of 90 °C (~194 °F) and a GPU temperature of 86 °C (~187 °F), the P651SG only reached 80 and 83 °C (~176 and ~181 °F) respectively, in the stress test – even though it is significantly quieter. 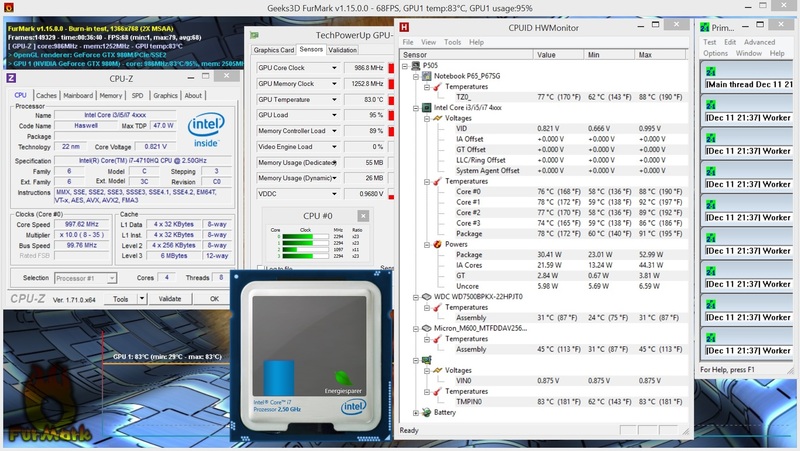 The Core i7-4870HQ in particular was a hot head in the P651SE, up to 100 °C (~212 °F) are pretty much at the limit. The GeForce GTX 970M finished our stress test with 74 °C (~165 °F). According to our information, it is normal that the GPUs have throttling issues in FurMark, a quick test with the Unigine Heaven 3.0 benchmark on the other hand did not show any sign of throttling. (-) The average temperature for the upper side under maximal load is 42.1 °C / 108 F, compared to the average of 32.9 °C / 91 F for the devices in the class Gaming. (-) The maximum temperature on the upper side is 54.2 °C / 130 F, compared to the average of 39.3 °C / 103 F, ranging from 21.6 to 68.8 °C for the class Gaming. Like its slimmer sibling, the P651SG has a 2.0 system from Onkyo. 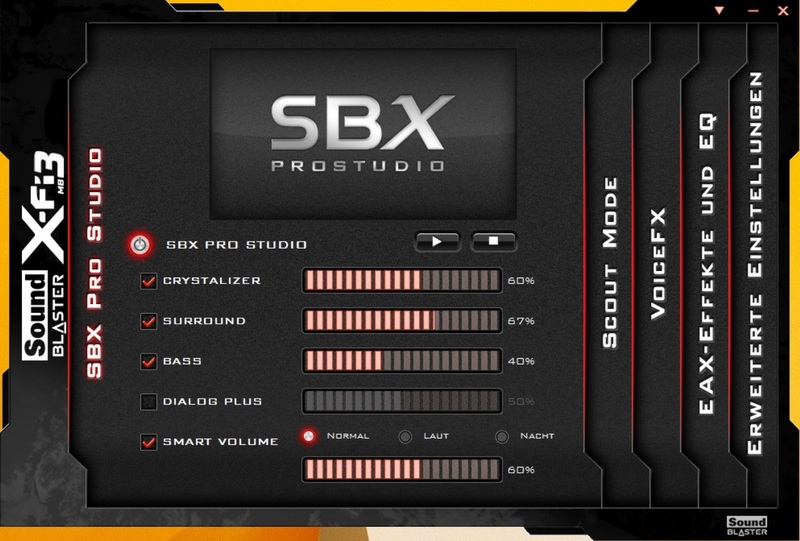 In combination with the SBX technology and the Sound Blaster X-Fi MB3 software, the device creates a pretty decent sound that easily beats many rivals. There has been a big improvement compared to old Clevo Barebones in particular (P150, W355, W650 ...). You will hardly notice the missing subwoofer with this bass. All in all, the sound is pretty balanced and precise. The good maximum volume deserves praise as well. The battery runtimes cannot be long enough for you? Then you should definitely get the Full HD panel, it consumes much less power than its 4K counterpart. We still had to criticize the high idle consumption of our review configuration with the P651SE (20-33 Watts), but our measurement device only showed 12-22 Watts for the P651SG. 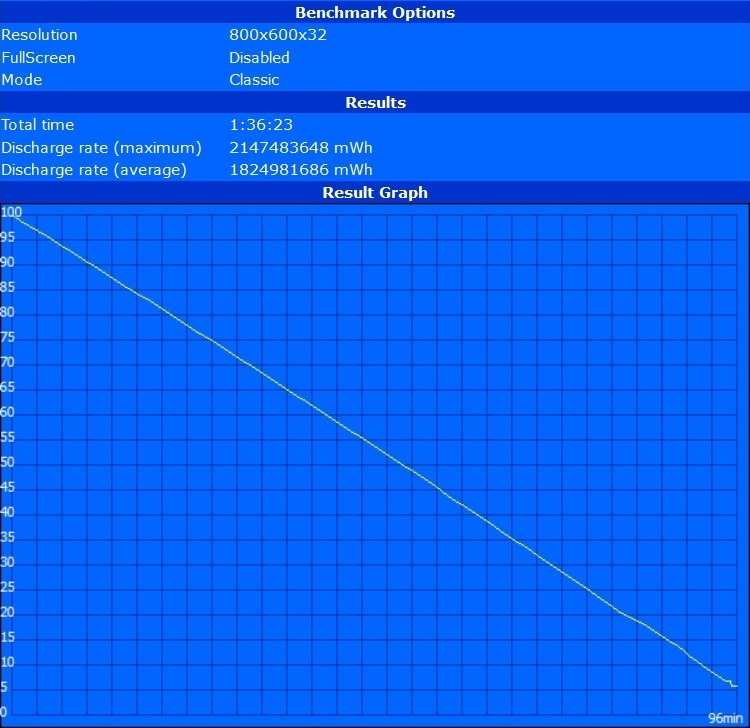 The Asus G751JY (22-33 Watts) shows that the consumption would be much higher without the Optimus technology. 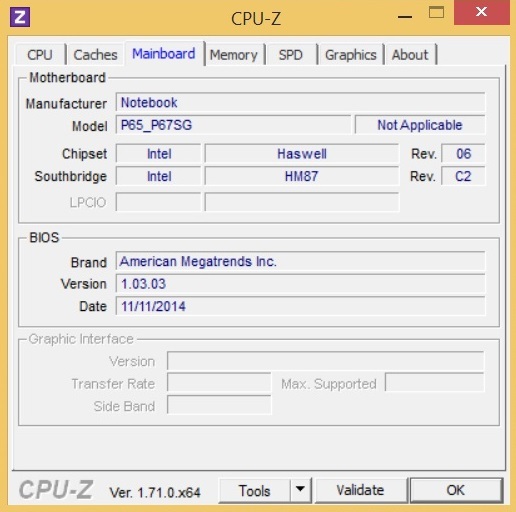 The load measurements also clearly show that the Core i7-4870HQ consumes a lot of power. 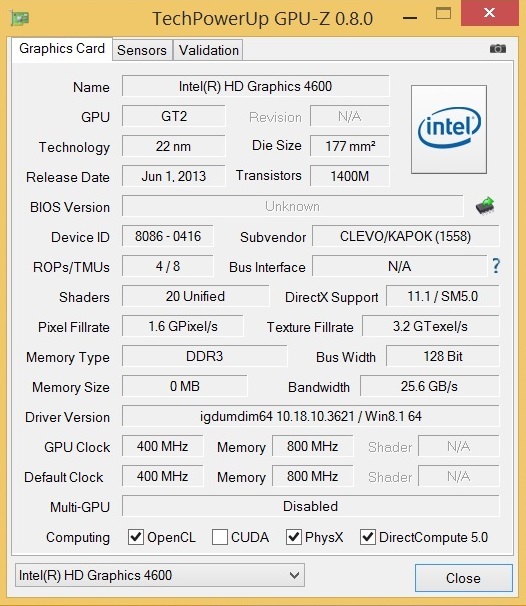 Despite the more powerful GPU, the P651SG only needs 94 instead of 111 Watts in 3DMark 06. Up to 208 Watts under load, however, raise the question about the output of the power adaptor. This value was measured at the socket, but the Turbo of the Core i7-4710HQ is also inactive in this scenario. A 200-Watt power adaptor would be better suited for the high-end components (MSI ships the GT72 with a 230-Watt PSU). Because of the smaller battery (60 vs. 75 Wh), the runtimes are shorter compared to the Gigabyte P35X v3. Potential buyers of the XMG P505 can expect up to five instead of six hours. Wireless web browsing with an adjusted brightness of 150 cd/m² is possible for around 3.75 hours. HD video playback is possible for around 3.5 hours (medium brightness). 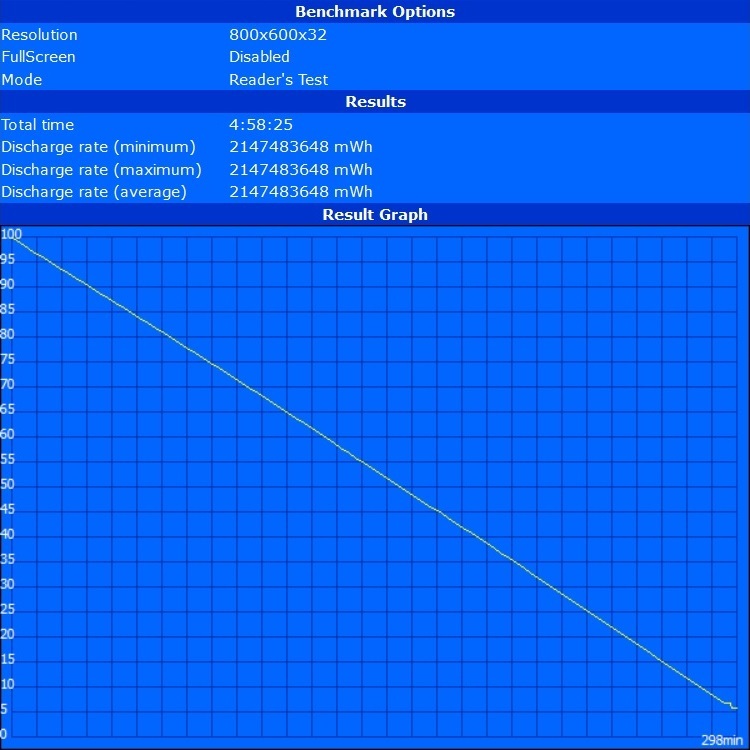 The Battery Eater Classic Test, which simulates a 3D scenario, determines a runtime of almost 1.5 hours. Overall, the runtimes are 50% higher compared to the 4K version. It might sound absurd, but the lack of the Core i7-4870HQ and the 4K panel, which were used in the first review unit, actually improves the rating of the XMG P505. 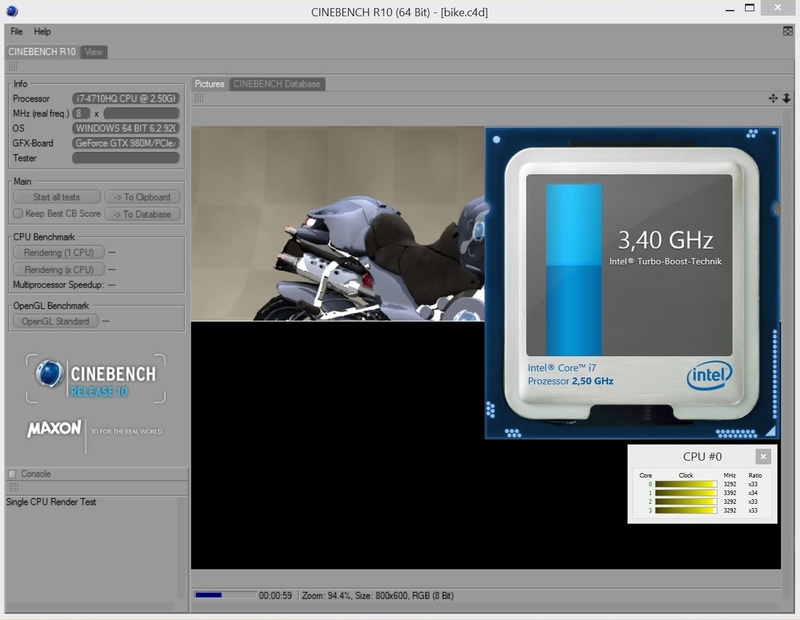 The Core i7-4710HQ results in lower temperatures and the Full HD version increases the battery runtimes. The panels are not very different in terms of picture quality. Both the AU Optronics B156HAN01.2 as well as the Sharp LQ156D1JX01B convince with a vivid and fairly accurate color representation, let alone the good viewing angles. 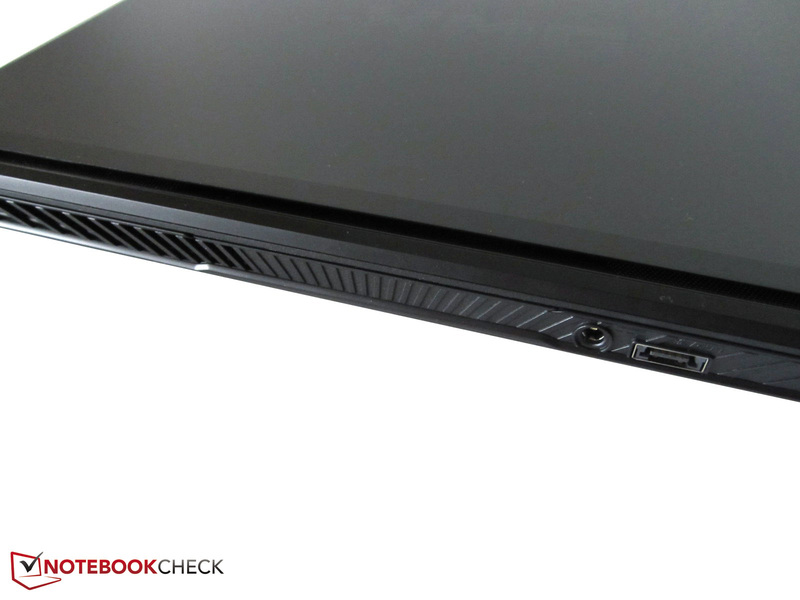 The chassis manufacturer finally improved some old weaknesses (fan control, sound, touchpad, design, ...), so the notebook can actually secure a top spot, which has been dominated by Alienware, Asus and MSI. 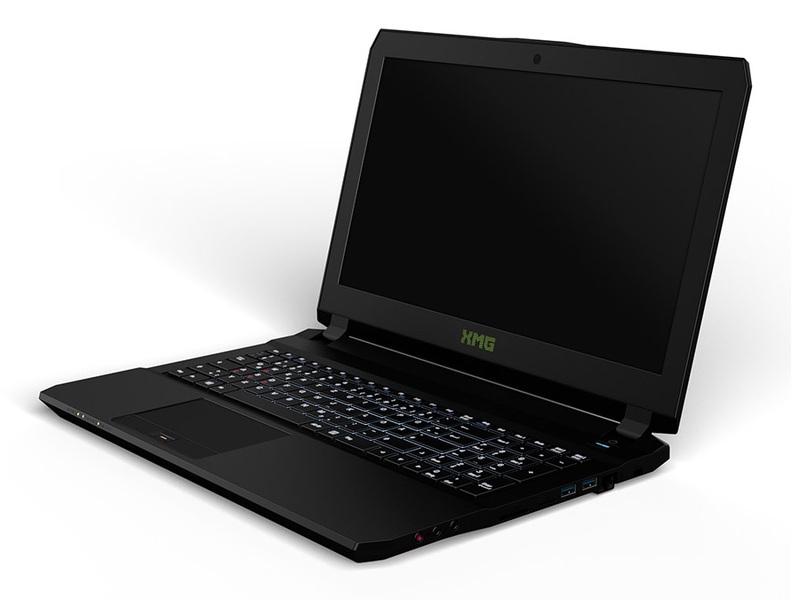 Due to the lack of high-end 15-inch gaming alternatives, the XMG P505 is the first choice for gamers. 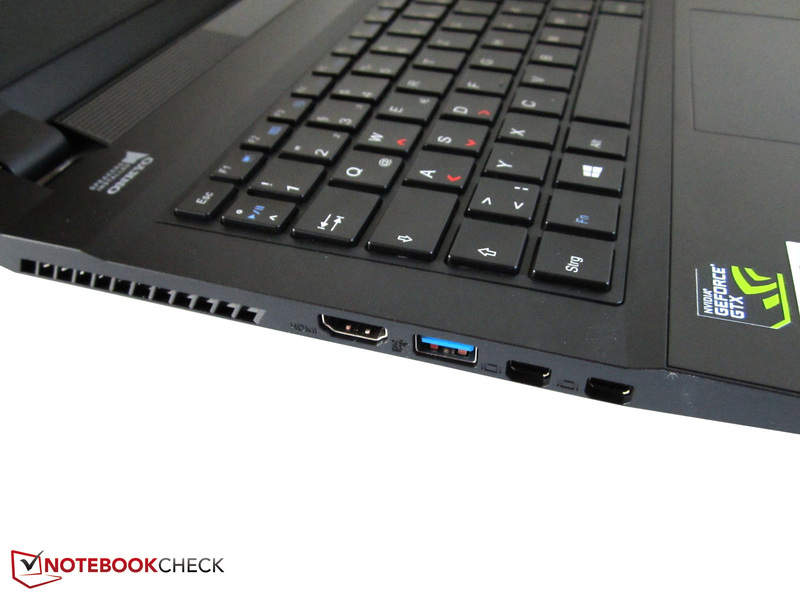 Other notebooks are either not powerful enough (Acer V 15 Nitro, HP Omen, Lenovo Y50-70), or the overall package cannot completely convince us (Gigabyte P35X v3). 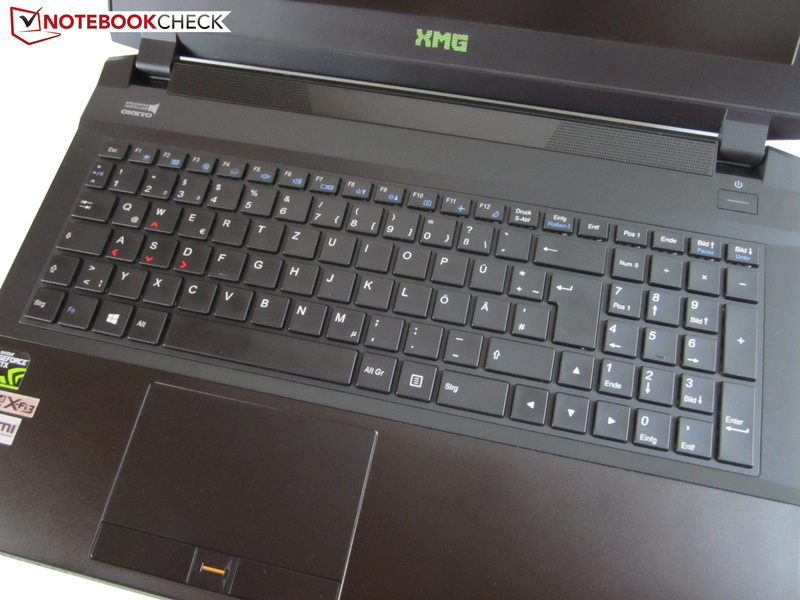 In Review: Schenker XMG P505 PRO. Review unit courtesy of Schenker Technologies. The chassis is almost three centimeters high and weighs around 2.7 kilograms (incl. HDD). Lid and palm rest are made of aluminum. You can remove the whole bottom cover. One fan handles the heat from the CPU. Two fans cool the GPU. Right next to the hard drive bay you can see the M.2 SSD. The keyboard has a white background illumination. The primary memory slots are underneath the keyboard. 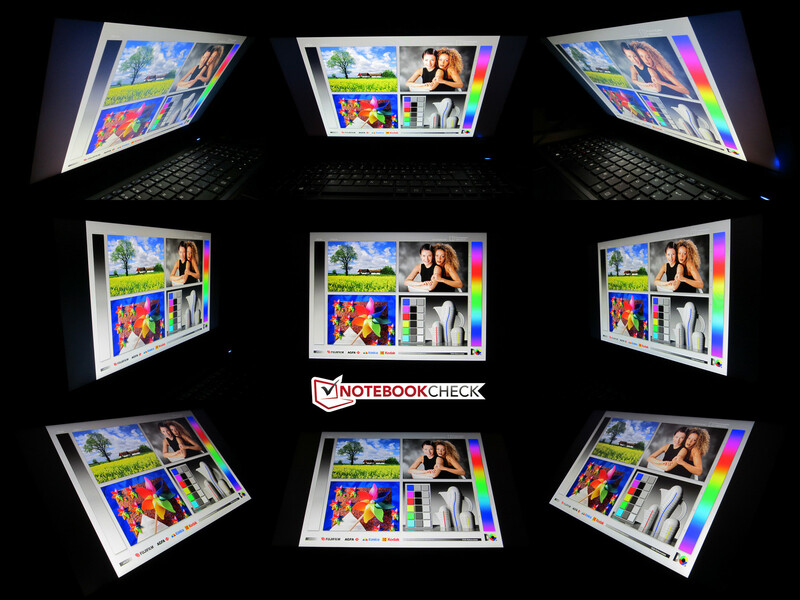 The notebook supports up to 32 GB RAM. Two slots are at the back. There are a lot of ports at the right side. There are certainly enough video ports. You will have a hard time to find a better panel at the moment. Why are the GPU and CPU soldered onto the mainboard? A screwed battery is not perfect, either. The notebook manages more than 80 % in almost every category. High-end devices with GeForce 900 GPUs like the Asus G751, Gigabyte P35X v3, MSI GS60/GS70, MSI GT72 or Schenker XMG P705.